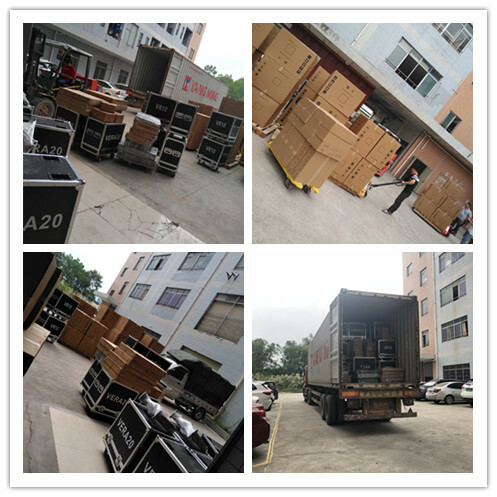 40HQ Container with Amplifier and Line Array ship to Middle East - Sanway Professional Audio Equipment Co., Ltd.
April 9th 2019 That is a great begging of April in Sanway Audio, because we just loaded a 40HQ container to the Middle East Markets. As you know, we just finished the Prolight Sound Guangzhou Exhibition, that was a great success. We met many new friends here, and they was found of our pro power amplifier and line array pa system so much, that we gained a lots of order. Order volume is rising. Sanway recently ushered in the peak of shipments, the workshop, warehouse, packaging, delivery of all aspects of the staff are busy. Thanks to every department hard-work, we finish a 40HQ container products in only 25 days. Now, you may carious that what products in the container? In order to meet the demand of our customers from all over the world, we have enlarge our production line to decrease the producing time, also our R&D department is researching a new powerful DSP amplifier and new design line array. You will see more new products on the market next month.